An erythrocyte characterized by multiple spiny cytoplasmic projections, as in acanthocytosis. /acan·tho·cyte/ (ah-kan´tho-sīt) a distorted erythrocyte with protoplasmic projections giving it a “thorny” appearance; seen in abetalipoproteinemia and other conditions. 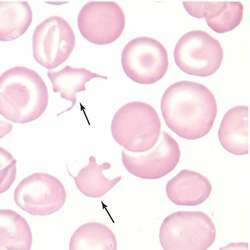 an abnormal peripheral blood film erythrocyte with irregular spurlike projections. Predominate in abetalipoproteinemia; fewer occur in liver disease. Compare burr cell, elliptocyte. See also abetalipoproteinemia,acanthocytosis. A densely stained spheroidal red cell with multiple (usually 5–12), irregularly distributed, thorn-like spicules of variable size, often with drumstick ends. Aetiology Hereditary abetalipoproteinemia* (hereditary acanthocytosis), severe (end stage) liver disease, hepatorenal failure, anorexia nervosa, chronic starvation. A small number of acanthocytes may be seen in severe haemolytic anaemia, especially post splenectomy, haemolytic anaemia due to pyruvate kinase deficiency, in neonatal hepatitis, after heparin administration, and rarely also in otherwise normal blood smears (one or two per smear), where they correspond to older, effete red cells approaching their “expiration” date of 120 days. Acanthrocyte Hematology An RBC with a irregularly spaced, pointed spicules, of varying shape and number–Greek, ακαντηο, spike; acanthocytes are seen in abetalipoproteinemia–hereditary acanthocytosis, as well as in alcoholic cirrhosis with hemolytic anemia, hemolytic anemia due to pyruvate kinase deficiency, in neonatal hepatitis, after heparin administration or splenectomy. See Red blood cells. An erythrocyte characterized by spiny cytoplasmic projections. an erythrocyte with protoplasmic projections giving it a thorny appearance; may be seen in dogs with liver disease and related disturbances of lipid metabolism and in dogs with hemangiosarcoma. Morphologically similar to spur cells, but biochemically distinct. See also spur-cell anemia. Acanthocytes of Stropharia rugosoannulata function as a nematode-attacking device. First report about the trapping activity of Stropharia rugosoannulata acanthocytes for Northern Root Knot Nematode. The most important diagnosis criteria of neuroacanthocytosis is the detection of acanthocytes in the peripheral blood; however, a diagnosis based on acanthocytes alone, without considering the clinical picture, may lead to a medical error (6, 7). Despite the different ratios reported by various sources, it is generally accepted that the ratio of acanthocytes in the peripheral blood in neuroacanthocytosis cases is 5% of total erythrocytes (2). Silveira also present hymenial acanthocytes, however their basidiospores are much smaller (up to 8 x 5 [micro]m). A new species of Stropharia with hymenial acanthocytes. rugosoannulata was able to infect more eggs than the other fungal treatments, which could be due to its high production of traps, acanthocytes (Luo et al. Acanthocytes typically comprise 50% to 100% of erythrocytes in ABL and may result from vitamin E deficiency or altered membrane lipid composition. A variant of band 3, 5HT, promotes the formation of acanthocytes, presumably through the binding of band 3 to the cytoskeleton.